Write what you know. Write from life. Tell your story. Over the years I’ve been privileged to meet some phenomenal people whose writing has grown out of their personal experiences, habits, hobbies and passions in remarkable ways. Hence this “Writing Family” series: a spotlight on various writers whose work has taken on new life from things they do every day. One such person is medieval-based fantasy writer Marissa Ames. Her Tir Athair series exposes the wonderfully intricate medieval world, populated with complex characters navigating moral quandaries common to the human condition in all ages of the world. Yet writing isn’t her only superpower. She is also a hard-core homesteader with an impressive skill set, from making homemade mozzarella to raising chickens, not to mention being a stellar from-scratch cook. With such a resume, it should surprise no one that she has a lot to bring to her writing in terms of worldbuilding. Wrapped up in the wonderfully complex characters of her series is their interaction with, and dependence on, a complex world that is all the more believable because she has lived out the agrarian life herself, and at a level most 21st century Americans only know from television and…well…books. 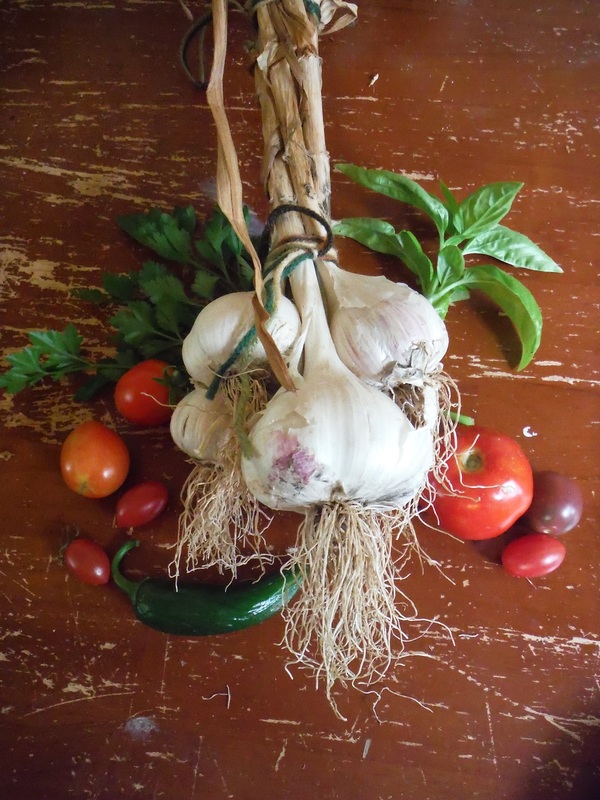 One day’s harvest in July 2014. For people like me who are new to the concept – what is homesteading, and how did it become one of your passions? Modern homesteading is a recent cultural movement encouraging people to make, grow, or raise products that they’d otherwise purchase. This reduces household costs and increases health, but also provides a greener and more giving community, hobbies that give instead of take, and a sense of satisfaction. It can be as simple as sewing your own clothes in a sky rise apartment, or involve off-the-grid farming, producing all but fuel for your truck. I was born into homesteading. Back then we called it “trying to survive.” My parents both worked full time (and more!) but my mom didn’t like the direction her kids were going while she was trying to earn a paycheck. So she quit that job and focused on raising 5 children, a few foster teenagers, and most of our food. We raised, grew, or hunted all except flour and sugar. My dad woke at 3am to milk cows in trade for the 2 gallons we drank per day. Mom sewed our clothes. If we wanted money, we raised lambs for 4-H or moved sprinkler pipe for local ranchers. We had to do extra chores if we turned on the electric heat. It cost so much less to drive into the mountains and fell dead pines for our wood stove. My husband is also from Idaho, so he grew up with a very similar philosophy. If you can’t make it…make it. Literally. So when the economy hit hard, we hit the shovels. 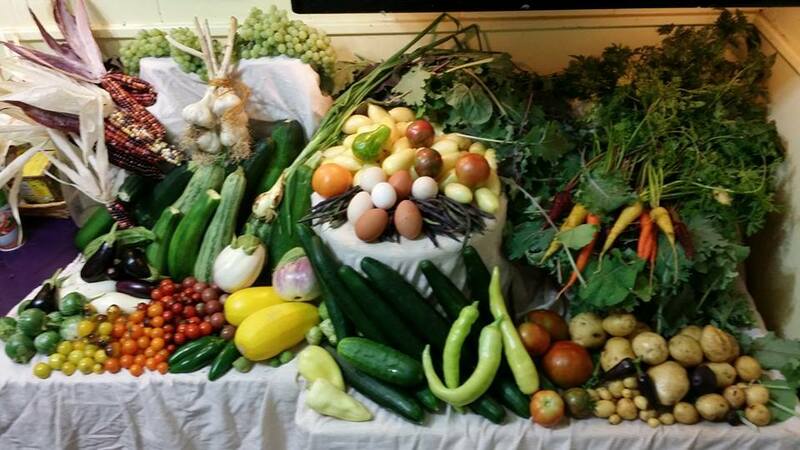 In 2012, I charted what we pulled out of our little city property: $3,500 in produce and eggs. It seems our parents had it right after all. 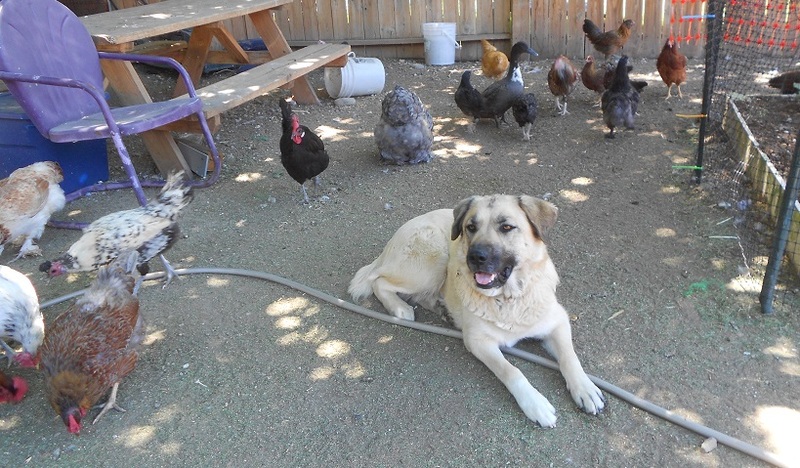 Tater the Chicken Guardian. Her nose is now scarred from defending the ladies from a raccoon. I would consider any “rooted endeavors” (farming, gardening, etc) to be, in a sense, a Creative Art that works with a living and moving canvass. As an “organic artist,” – what would you say is the greatest value in connecting one’s creative pursuits with a current writing project? Seasoned writers will tell you: “Write what you know.” A lot of research time can be saved if you connect your existing knowledge with your story. And since I write fantasy, I can’t stick exclusively to that admonition. I don’t know what it’s like to be a medieval heiress as her uncle secretly stages a rebellion on her fief. But I know enough about lambing to set up a scene where she’s “up to her wrists in sheep womb” when a massive, drunken stranger approaches with his sword. 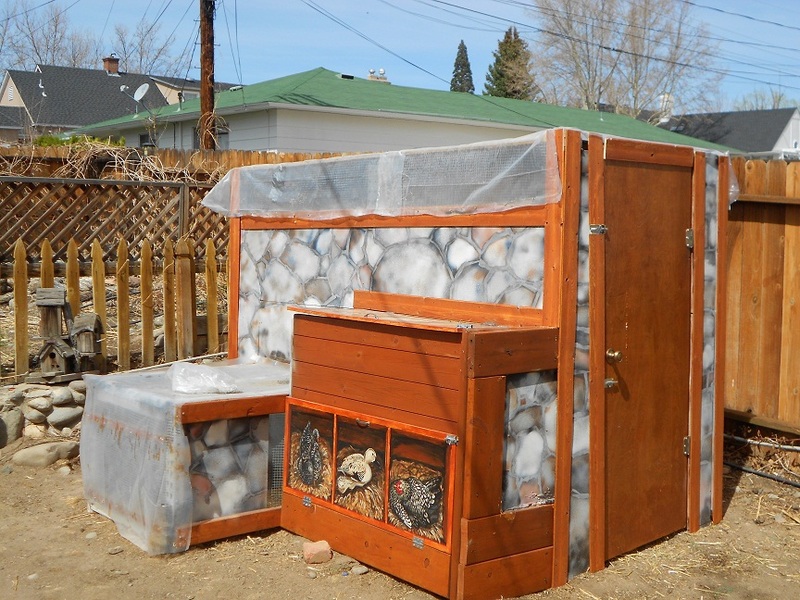 My $200 chicken coop, which houses about 50 chickens at night. All except for the hardware, paint, and trim were from recycled items. Having read your debut novel Minstrel, I can see how your passion has cascaded into your writing. I found that those details add to the plot, especially in those scenes where scarcity of food becomes a driving catalyst for the main characters. In your writing, how do you find the balance between including what you love and letting your passion overtake your story? If I wanted to write a book on homesteading, I’d write nonfiction. I’d cover my passion from front to back, inside and out, until all the cliches were used up. But fiction should include just enough to drive the plot. 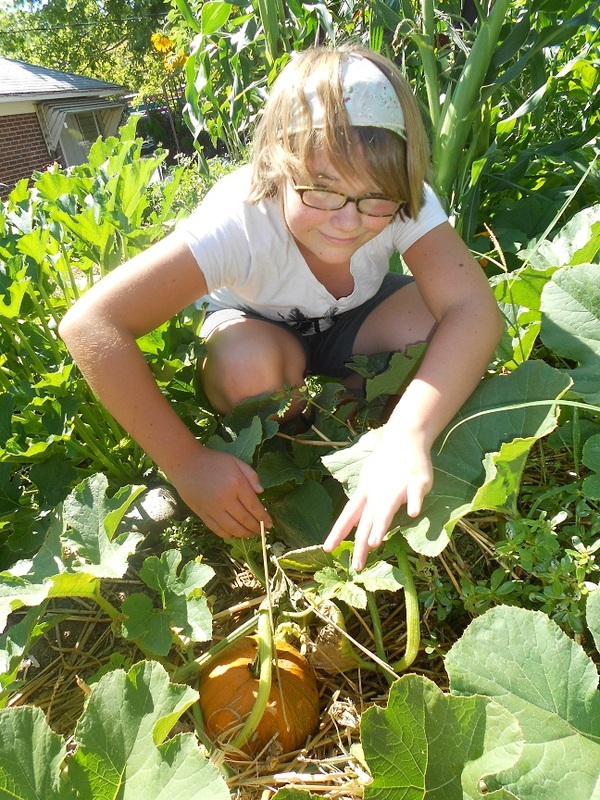 If you’re writing about a farm, research the animals, crops, seasons and precipitation. And after all that, include just enough to give the reader a sense of setting. Minstrel uses weather and crop failure as reasons for a famine. And the famine supports the main plot of king vs. brother and how two not-so-horrible rulers still aren’t good enough. Plot and setting, that’s it. Nothing more. 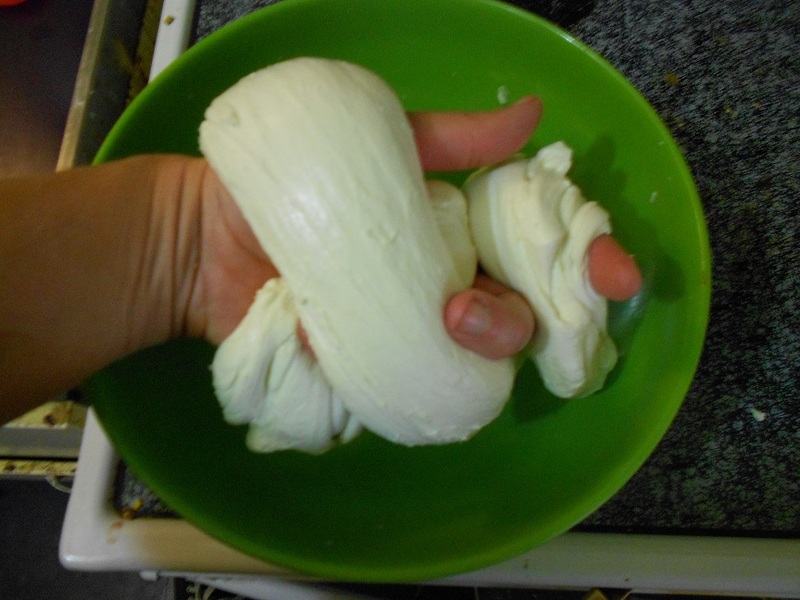 Showing the proper stretch of homemade mozzarella curds. As a potter, I know how one’s creative pursuits can swallow a great deal of “free time.” Writing also requires a good deal of time in order to make it happen. How do you consistently juggle two such time-intensive pursuits? I’m glad you said “consistently” instead of “successfully.” Nothing is ever done to success. It’s just done, and juggling is an appropriate comparison. I try to complete my drafts when it’s too cold to garden. Edits start mid-March, when it’s also time to start seedlings. If most of the book isn’t done by mid-May, it’ll be pushed aside in lieu of weeding and watering. I depend on my husband and teenage children, since I also earn a daytime wage. The kids are old enough to understand that success is a family endeavor. If they don’t help clean, garden, and care for animals, they’re eating cheap mac-and-cheese and don’t get into comic cons where I have my book signings. 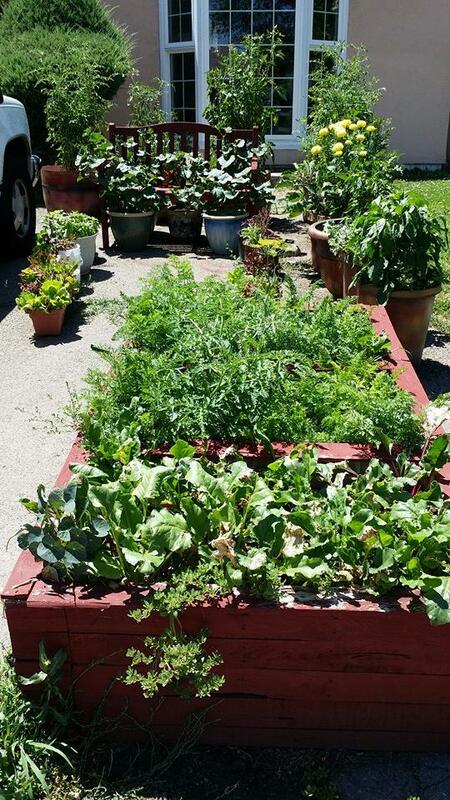 My driveway garden in 2014. All of this is on top of half of my concrete driveway. What writing projects are you working on now? Can you give us a hint of what is on the horizon for the Tir Athair series, or other ideas in the works? I’ve plotted out Huntsman, the third book of Tir Athair, which involves a condemned man whose execution wagon takes a wrong turn at the market square. He’s sold into indentured servitude from Tir Athair to Tir Saoirse, to hunt a breed of golden bear which interferes with the Saoiran king’s efforts to expand civilization. When he realizes what this “bear” actually is, and the mad queen behind the Saoiran king’s demands, he becomes prey within a foreign kingdom. His only salvation is the very bear he was hired to hunt. You can also find Minstrel and “Darrion” on Audible.com. What about you? What things in your life color your writing world? Angela Goff of Anonymous Legacy has interviewed me! Read her blog post to learn how my real-life homesteading efforts enhance the Tir Athair series. Love this interview, so much packed in, just like Missy’s life! I did a lot of gardening, mainly flowers, but some veg, some years ago, but wound down due to a back condition. We’re slowly changing our gardening habits to include fruit and veg again, but in containers instead. I’ve seen Missy’s containers, a real inspiration! …and the world within Tir Athair is so well written, it feels like your reading actual history. Great Post! Love hearing about Missy’s journey.